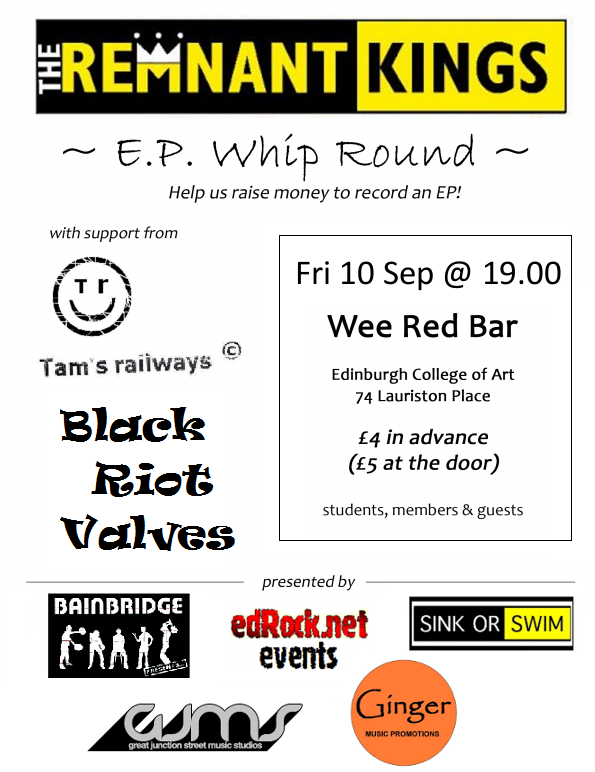 The Remnant Kings E.P Whip Round will take place on Friday 10th Sept 2010, in the Wee Red Bar. 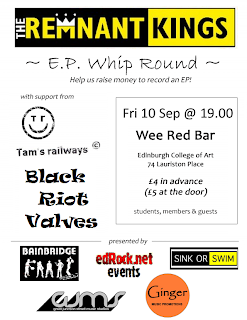 All profits from the night will go towards the cost of recording and releasing of the band's debut E.P.As well as a live set from The Remnant Kings, support is provided by Tam’s Railways and Black Riot Valves. And the backline is provided by Bainbridge Music and Great Junction Street Music Studios. Wee Red Bar also has terrific drink deals. Not only that, but fans will be given the chance to vote for which songs they want to see recorded, and anyone who buys a ticket for this fundraiser show will get free entry to the E.P launch event, when the E.P is recorded. The show starts at 19.00, and tickets on the door will be £5. You can get advance tickets for £4 by contacting edRock.net over email or Myspace, by contacting The Remnant Kings over Myspace, Facebook, or email, or in person at Great Junction Street Music Studios.